The history of postage stamps in Canada is almost as rich as the country itself. As the Canadian provinces that were formerly British colonies began to unify, they first were known as the Confederation. This did not last, however, and the Dominium of Canada formed shortly thereafter, in 1867. 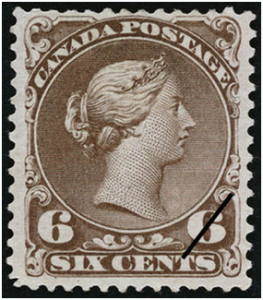 This marked the start of the classical Canada stamp period, which lasted until 1902, at which point the Victorian age came to an end. These were followed by Canada postage stamps that are dubbed Canada Early Issues, running from 1902 to 1943. The uniform postal system of the new Dominion began in 1868, with An Act for the Regulation of the Postal Service. Shortly thereafter, stamps began to issue, including one- and three-cent stamp. A common problem was that these stamps were far too alike in color, leading to misuse of the stamps and necessitating a change in 1869. The one-cent stamps were changed to brilliant orange in order to better distinguish them. Valuable Canadian stamps of this era include the popular 1897 Queen Victoria Jubilee issue, which were printed by the American Bank Note Company and meant to celebrate Queen Victoria’s 60th year, and 30 years under the confederation. These were actually the first real commemorative stamps created for Canada. There was also the Imperial Penny Post, which showed a map of the globe, with colonies that belonged to the British being depicted in red ink. Another notable stamp is the large 5 cent stamp, which was issued in 1875, even though the die for it was engraved at the same time as other stamps issued in 1867. However, there were no postal rates that required a 5 cent denomination, which is why it was not released until years later. In 1875, the rate for a single letter that would travel between Canada and Britain went down to 5 cents, per a treaty signed in Berne, Switzerland. This was organized between the representatives of Post Offices of each of the major nations then in the world. These 5 cent postage stamps of Canada bore many similarities to other denominations of the time, including printing via a line-engraved process, though the center medallion depicting the Queen was encircled with a corded border, instead of the plain line of previous depictions. It should be noted that Prince Edward Island joined Canada during this era, in 1973. At that time, it created a glut of inexpensive stamps in the market by selling off its pre-Canadian stamps, but these ended up having little to no value. As a result, forgers were disinclined to copy these stamps, creating the rare circumstance in which forged stamps of these types are actually more rare and valuable than genuine stamps of this type and of this era. If you wish to know more about Canada Classic Issue stamps, we invite you to contact Treasure Coast Stamps to learn more.